"Nul ne peut en douter, Ambrogio Maestri règne aujourd'hui sul “Falstaff”. Et ce royaume, il l'agrandit d'année en année, puisque nous en voici au cinquième DVD qui l'immortalise dans le testament de Verdi […] Avec la producion filmée au Met […] on tient un version transposée au Xxe siècle mais réalisée avec une subtilité et un goȗt qui font de cette captation une référence […] Ambrogio Maestri, pour qui l'on monte “Falstaff” un peu partout, qui l'a chanté sans attendre de ne plus avoir voix, comme cela arrive trop souvent, et qui n'a quasiment pas besoin de rembourrage pour camper le rôle-titre; acteur de chaque instant, qui possède son personnage de fond en comble, qui le vit désormais, à condition que la mise en scène le lui permette, ce qui est le cas ici..."
"Nobody can doubt that Ambrogio Maestri rules today over “Falstaff”. He enlarges this kingdom year by year, since he almost reached the fifth DVD that consecrates him on Verdi’s testament […] This Met production is set in the 20th century, but realised with a subtlety and fineness that make it a landmark […] Everywhere “Falstaff” is staged right for Ambrogio Maestri, who started singing it without waiting to have no voice more, as it often happens, and who has almost no need to wear a pillow to interpret this title role. Actor in any moment, he possesses his character from top to bottom, if the mise-en-scène allows him to..."
Hay que mencionar el splendido Scarpia cantado por el baritono Ambrogio Maestri. Como habia aparecido hace poco en L‘Elisir d‘amore, cantando Dulcamara, algunas personas poco informadas pensaban que se trataba de un personaje poco adequado para el papel del malvado policia, pero pronto quedaron desenganadas. Maestri hizo honor a su apellido entervino en el Te Deum de forma magistral y fue un perfecto torturador en el segundo acto con una muerte terrorifica (como corresponde a una opera verista). La larga escena con Scarpia estuvo sensacional. Ambrogio Maestri, seguro, rotundo, imponente, señoreó el verdadero personaje central de Tosca, el lascivo Scarpia, un príncipe del mal, un papel agradecidísimo, un encanto de personaje. Ambrogio Maestri fue un Scarpia de manual, con elegante línea de canto, dicción superlativa y representando todo el poderío del malvado barón con su imponente proyección. Ambrogio Maestri, grandísimo Scarpia, en voz, en dramatización y en presencia. Llena el escenario con toda su impresionante calidad y realmente se hace odiar y se hace admirar a la vez. Espero que vuelva a menudo al Liceu, es un absoluto placer verlo en escena. El lascivo, perfido e inquisidor baron Scarpia encontroò en el imponente baritono Ambrogio Maestri al Malvado ideal. Sinuoso, seboso y dueno de un solido y seguro timbre destacò tambien por su poderosa presencia escenica. Completó con magisterio el trío en discordia, el monumental Scarpia de Ambrogio Maestri, un malvado de pies a cabeza. Su encarnación del perverso y depravado jefe de la policía romana fue antológica, alcanzando unas cuotas de maestría canora y autoridad escénica que nos recordaron las inolvidables recreaciones del gran barítono menorquín Joan Pons. Per la seva banda, el millor musicalment parlant va ser Ambrogio Maestri, Scarpia gegantí -en tots els sentits del terme- i molt personal, tot i que se li nota la fascinació que sent cap a Tito Gobbi. Músic extraordinari i actor inqüestionable, el baríton italià revesteix el personatge amb la maldat i la lascívia que escauen al cap de la policia romana”. La noche del estreno de «Tosca» en el Liceu los triunfadores fueron la soprano Sondra Radvanovksy y el simplemente perfecto Scarpia del gran Ambrogio Maestri. 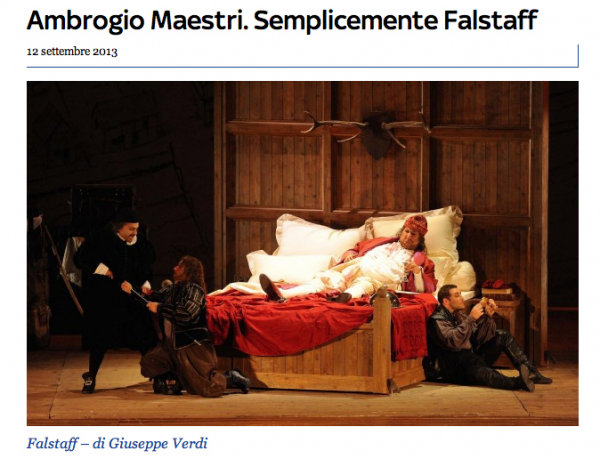 Ambrogio Maestri, in the title role, has the makings of once-in-a-genaration Falstaff. His voice rings out freely, and he sings with incisive diction and an instinctive understanding of Verdi‘s compressed, propulsive phrases. A splendid cast is headed by the powerhouse Italian baritone Ambrogio Maestri, who simply owns the role of Falstaff. This was his 200th performance of it. At six-foot-five with his Falstaffian physique, Mr. Maestri certainly looks the part. A natural on stage, and surprisingly light on his feet, he makes Falstaff a charming rapscallion and sings the music with consummate Italianate style. And it is hard not to pay attention to this Falstaff. Baritone Ambrogio Maestri is a huge talent—a voice with power and penetration, impeccable diction and fine comic timing. He's also imposing, with his towering height and Falstaffian girth. It's wonderful to hear a buoyant Falstaff who doesn't sound as though he's at the end of his vocal career. But the star of the show was of course Falstaff himself, Ambrogio Maestri, his huge, warm baritone soaring generously into the auditorium. The jolly giant never clowned but rather played the lecherous knight with exaggerated dignity and self-importance, making the character not only funny but moving as well. When he launched the finale fugue on the text “tutto nel mondo è burla” (“everything in the world is a joke”), you could tell this was a man who was in on the gag. 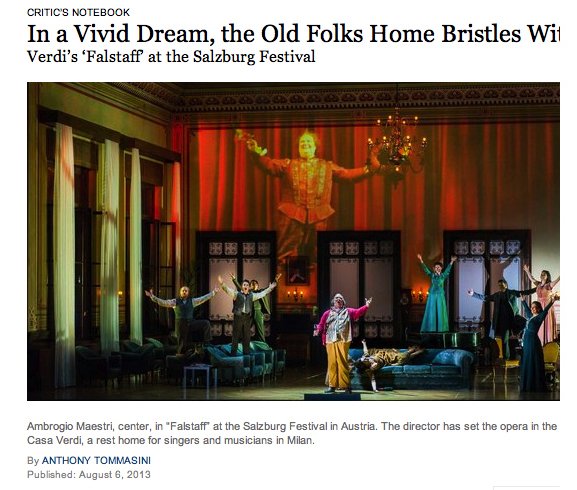 Ambrogio Maestri may be only 43, but he is already the Falstaff of choice the world over. We are lucky to be contemporaries of Ambrogio Maestri, who has chosen to build his international reputation largely on this one role. And rightly so, because his performance last night in the MET HD Live relay was a tour-de-force. There was such warmth in his baritone voice and such artistry as he floated high notes, attacked sequences with rhythmic precision, balanced humour and pathos and gave us a consistently engaging performance. He may be a million miles from a typical English knight, but is to my ears the quintessential comic Italian baritone of the 21st century. Ambrogio Maestri is superb as Falstaff. Tall as well as stout, he dominates the proceedings, as he should. His facial expressions are apt, and they can really be appreciated when seeing the opera in close-up on a wide screen. For example, savor him peeling the foil from a wine bottle with his teeth, then inserting the corkscrew and popping the cork in perfect synchronization with Verdi's music. His voice is more lyrical than most Falstaffs yet has power when needed. In his first-act "Questo e il mio regno! Lo ingrandiro! (This is my kingdom and I will make it grow)," Maestri's voice blooms on a gorgeous high F on the word regno. He is sympathetic as a deluded fool and a vainglorious inept lover who still is capable of moments of grace and elegance. Ambrogio Maestri, ever hearty, projects towering bravado and rare baritonal fervour in the title role, even when modelling saggy underwear or dressy plus-fours. Significantly, his Falstaff bulldozes the delicacy of “Quand’ero paggio” while he devours a roast chicken. The great “Mondo ladro” monologue serves as an irksome visual duet for fat knight and hungry horse . Maestri brings both comedy and a strange majesty to the role. A part so easily played for laughs is given a deeper dimension. mbrogio Maestri was totally believable as Falstaff; his baritone voice is as imposing as his physique but he can slim his sound down to a delicate whisper if necessary, also he has a well-supported legato and an impressive top to his voice. He never overdoes the comedy and the pathos he elicits is all the better for his restraint. Any kudos start with the stellar performance by Italian baritone Ambrogio Maestri in the title role (seen December 27), who, at 43, has racked up more than 200 performances as "Big Belly" (Verdi's and Boito's code name for the developing opera). He has enormous stage presence--at 6 foot 5 inches and with the physical heft to go with his prodigious vocal resources. At the same time, he is light on his feet, as well as being a pleasure to hear and an exuberant colleague. (It would be interesting to see what he does with Scarpia, another current role in his repertoire.) He manages to keep his dignity even when thrown in a laundry basket or running around in his long-johns. Maestri walked away with nearly every scene--except when he's drying off in the stable after being thrown in the river, and he is mightily upstaged by a live horse chomping away at his feed as if it's the only thing in the world. 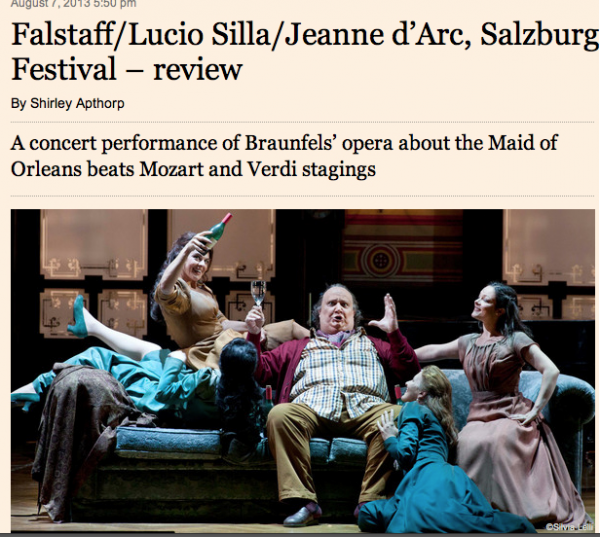 Maestri is a natural as Falstaff. He is a mountain of a man with a soaring baritone to match and he dominates the stage as any Falstaff should. With subtle phrasing and rich vocal brilliance, Maestri creates a Falstaff whose pomposity and gullibility is both hilarious and appealing. He delivers the opening act aria "L'onore" with the solemnity of a judge passing sentence, and while the second act "Va, vecchio John" brims with the confidence of a man embarking on a conquest, the third act reprise (in "Io, dunque") becomes a rueful meditation. 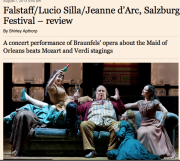 I’ve been eagerly awaiting Maestri’s take on Falstaff since marveling at the basso buffo’s deliciously devious “doctor” Dulcamara in last year’s Met Opera production of L’Elisir d’Amore. Then, as now, Maestri’s powerful bass-baritone soared through the air with the ease of a whistle sounding from a mighty locomotive — with no loss of steam even in the sustained high notes. But his mastery of this role goes well beyond the singing. Saturday’s performance marked Maestri’s 202nd for this role, and it’s safe to say that somewhere along the way he got it right. Very right. Standing at 6 feet 5 inches tall and carrying a weight I’m not at liberty to divulge, Maestri easily captures the visual sum total of Shakespeare’s commanding comic character in all its, well, ernormity. Whether angry, happy, self-content, self-deprecating or just plain thirsty, Maestri’s character drew laughs from an audience that seemed delighted with his every movement. We chuckle when Maestri scolds Bardolfo and Pistola for daring to evoke “honor” as justification for refusing to do Falstaff’s bidding (L’onore! Ladri!). When he counters Mistress Ford’s observations on the girth of his stomach, Maestri draws tears of laughter recounting his (grossly distorted) memory as a young, handsome and svelte Duke of Norfolk (Quand’ero paggio del Duca di Norfolk). And when Maestri’s eyes light up at the prospect of a ménage a trois after Alice innocently remarks that Meg is following her, the hilarity approaches the threshold of pain. Sogar Ambrogio Maestri, den sich als Falstaff derzeit keine große Bühne entgehen lassen mag, ist bei all seinem überlebensgroßen Darstellungsdrang ein folgsames Ensemblemitglied – und das sowohl im knallroten Reitjackett wie im monumental besudelten Strampelanzug. Nicht bloß von seiner spektakulär gerundeten und in die Höhe geschossenen Statur her scheint er für die Rolle geboren, ein Pfundskerl, auch sängerisch, der zu mark- und ohrenerschütternden Ausbrüchen in der Lage ist, aber immer wieder auch zu berührender Zartheit findet. Somewhere out there may be a better incarnation of this meaty antihero, but when you experience Maestri in the flesh, that possibility seems awfully wispy. 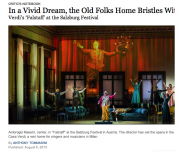 The economy-size singer wields his abundant body with dexterity, so that Falstaff’s belly practically becomes a character unto itself: a demanding, stubborn, and irresistible appendage that gives its owner vigor but also drags him down. It also supports a prodigious diaphragm whose vibrations launch a big, heavy voice into the air, giving it unexpected agility and grace. Maestri’s baritone is the sound of a man at ease with his own physicality: It seems “natural” — always an illusion in opera, since training the vocal cords to produce those blaring sounds is the work of years. Ambrogio Maestri practically owns the role of Falstaff these days; he plays the character with charm and a surprising amount of subtlety. ... Maestri interprets Boito’s text impressively and his diction carries every word. He also gives a physical performance which reminds us that, for all his grossness and debauchery, Sir John is still a knight and capable of moments of grace and elegance—particularly when he is trying to win a lady’s eye. The magnetic Ambrogio Maestri gave Falstaff one of the most pleasing baritone voices since Sherrill Milnes sang the role, but with an extra roar at significant moments that reveals the muscle behind the character's paunch.